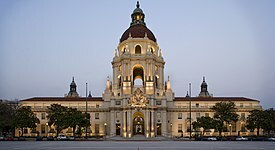 The original inhabitants of Pasadena (a Chippewa word meaning "Crown of the Valley")  and surrounding areas were members of the Native American Hahamog-na tribe, a branch of the Tongva Nation. They spoke the Tongva language (part of the Uto-Aztecan languages group) and had lived in the Los Angeles Basin for thousands of years. Tongva dwellings lined the Arroyo Seco (Los Angeles County) in present day Pasadena and south to where it joins the Los Angeles River and along other natural waterways in the city. Pasadena is a part of the original Mexican land grant named Rancho del Rincon de San Pascual,  so named because it was deeded on Easter Sunday to Eulalia Perez de Guillén Mariné of Mission San Gabriel Arcángel. The Rancho comprised the lands of today's communities of Pasadena, Altadena and South Pasadena. Before the annexation of California in 1848, the last of the Mexican owners was Manuel Garfias  who retained title to the property after statehood in 1850. Garfias sold sections of the property to the first Anglo settlers to come into the area: Dr. Benjamin Eaton, the father of Fred Eaton; and Dr. S. Griffin. Much of the property was purchased by Benjamin Wilson, who established his Lake Vineyard property in the vicinity. Wilson, known as Don Benito to the local Indians,  also owned the Rancho Jurupa ( Riverside, California) and was mayor of Los Angeles. He was the grandfather of WWII General George S. Patton, Jr. and the namesake of Mount Wilson. 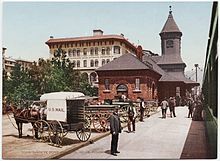 The popularity of the region drew people from across the country, and Pasadena eventually became a stop on the Atchison, Topeka and Santa Fe Railway, which led to an explosion in growth. From the real estate boom of the 1880s until the Great Depression, as great tourist hotels were developed in the city, Pasadena became a winter resort for wealthy Easterners, spurring the development of new neighborhoods and business districts, and increased road and transit connections with Los Angeles, culminating with the opening of the Arroyo Seco Parkway, California's first freeway. 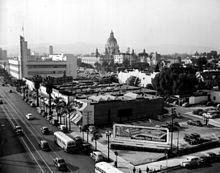 By 1940,  Pasadena had become the eighth-largest city in California and was widely considered a twin city to Los Angeles. The situation did not improve. Downtown Pasadena became dangerous in some parts and deserted in others, and incidences of murder and arson skyrocketed. Old Pasadena faced destruction as plans for new high-rise developments were drawn up, though they were mostly stopped by increasingly active preservation advocates. 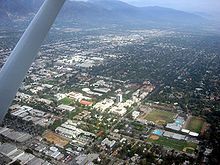 Pasadena suffered demographically as many residents decamped for the nearby suburbs or the Inland Empire, causing an overall decrease in population. [ citation needed] Despite these setbacks, many local artists and hipsters moved in to take advantage of low property values. Their legacy can be seen today in the Doo Dah Parade which began in 1976. Pasadena has a Mediterranean climate ( Köppen Csa), with typically hotter summers and slightly cooler winters than nearby coastal areas. 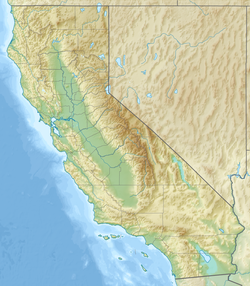 Its location relative to the San Gabriel mountains allows the orographic lift to tac on several more inches of rainfall per year than nearby areas. During the first few months of the year, Pasadena experiences cool to warm highs, typically in the upper 60s to lower 70's. Colder days are usually accompanied by heavier rain. By April, temperatures warm further, and rain tapers off significantly. By May and June, rain is typically sparse, but the infamous marine layer becomes more persistent. Locals have dubbed June "June Gloom" as it is the cloudiest month despite being the 3rd driest month. By July, the marine layer subsidies as inland areas cool due to an increased monsoon flow. Heatwaves from July through October can be oppressive and lengthy. In addition, it rarely rains during the summer and fall months, and only does when the remnants of hurricanes and tropical storms pass by. In fact, some days in both July and August have never recorded rainfall. It is not impossible to go 6 months without measurable precipitation. The average highest temperature recorded each year is around 106 degrees. The hottest heatwaves of the year usually occur in mid to late September. By late October, temperatures drop off. By November, Pacific storms return to Pasadena, bringing increasingly heavy rain and cooler weather. Along with them, however, are the Santa Ana winds. The Santa Ana winds can produce heat, high winds, power outages, tree damage and an increased wildfire threat whenever they strike. By December, lows typically drop into the 40s with the occasional reading in the 30s. Highs remain around 68 with heatwaves pushing temperatures into the mid-80s. A high temperature of at least 85 degrees has been recorded on all 365 days of the year, with temperatures over 100 degrees possible April through early November. 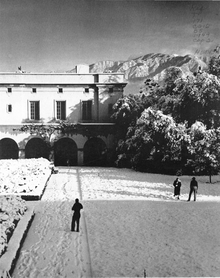 Situated at the base of the San Gabriel Mountains, snow is known to fall occasionally in Pasadena. The heaviest snowfall in Pasadena history occurred on January 11, 1949; 8 inches (0.20 m) fell at Pasadena’s city hall and more than 14 inches (0.36 m) fell in the foothills above the city. The most recent snowfall in Pasadena was 1 inch (0.03 m) on February 21, 2019. On November 30 and December 1, 2011, Pasadena, along with surrounding communities, was struck by a major windstorm caused by Santa Ana winds. The city suffered heavy damage with trees toppled, buildings damaged and even the roof of a gas station torn off. There were 59,551 housing units at an average density of 2,574.8 per square mile (994.1/km2), of which 24,863 (45.0%) were owner-occupied, and 30,407 (55.0%) were occupied by renters. The homeowner vacancy rate was 2.3%; the rental vacancy rate was 6.6%. 64,306 people (46.9% of the population) lived in owner-occupied housing units and 69,323 people (50.6%) lived in rental housing units[ citation needed]. The Pasadena Symphony, founded in 1928, offers several concerts a year at the Ambassador Auditorium and the Pasadena Pops plays at the Los Angeles County Arboretum and Botanic Garden. The Civic Center also holds a few traveling Broadway shows each year. The legendary Pasadena Playhouse, presently in reorganization, usually presents seven shows a season, each show running six to eight weeks. The Furious Theatre Company is one of several small theatre companies in Pasadena. 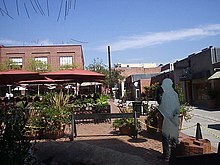 They are currently housed in the Carrie Hamilton Theatre adjacent to the Pasadena Playhouse. Boston Court Performing Arts Center, opened in 2003, is near Lake and Colorado. Its resident theatre company, the award-winning The Theatre @ Boston Court, presents four productions a year. Music at the Court presents numerous music concerts each year, ranging from classical to jazz. The Friends of the Levitt organization presents a free summer concert series in Memorial Park, with the 2008 summer season marking its sixth year. The 1960s song " The Little Old Lady from Pasadena" parodies a popular Southern California image of Pasadena as home to a large population of aged eccentrics. In the song, Jan and Dean sing of an elderly lady who drives a powerful " Super Stock Dodge" muscle car and is "the terror of Colorado Boulevard." The Dead Kennedys paid a tribute to this archetypal song in the track "Buzzbomb From Pasadena" in the album Give Me Convenience or Give Me Death. Pasadena was also the location of the 2012 film Project X.
Bungalow Heaven is a neighborhood of 800 small craftsman homes built from 1900 to 1930. Many of these homes are still occupied. Much of the area became a landmark district in 1989,  and annual historic home tours have been conducted since that designation. Bungalow Heaven's borders are Washington Boulevard to the north, Orange Grove Boulevard to the south, Mentor Avenue to the west, and Chester Avenue to the east. The neighborhood is usually extended to Lake Avenue to the west and Hill Avenue to the east. Famed architects Greene and Greene built several of their Japanese-inspired bungalows in Pasadena, including the Gamble House; the style of the homes in Bungalow Heaven show the effects of their success. 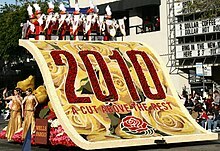 The maker of Wrigley's chewing gum, William Wrigley Jr.'s, substantial home was offered to the city of Pasadena after Mrs. Wrigley's death in 1958, under the condition that their home would be the Rose Parade's permanent headquarters. 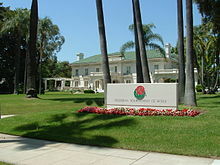 The stately Tournament House stands today, and serves as the headquarters for the Tournament of Roses Parade. Adolphus Busch, co-founder of Anheuser-Busch, brewer of Budweiser beer, established the first of a series of Busch Gardens in Pasadena. When Busch died at his Pasadena estate, his wife generously offered the property to the City of Pasadena, an offer the city inexplicably refused. Henry Markham, who lived adjacent to Busch, was the 18th Governor of the state of California (1891–1895) and wrote Pasadena: Its Early Years. The home of David Gamble, son of consumer product maker James Gamble of Procter & Gamble, is located on the north end of Orange Grove Boulevard. The Rose Bowl stadium was the home ground for the Los Angeles Galaxy of Major League Soccer from the team's inception in 1996 until in 2003, it moved into the soccer-specific Home Depot Center (now the StubHub Center) in Carson, California. The venue additionally hosted the 1998 MLS Cup. Many concerts and other events have been held in the stadium, such as Beyonce and Jay Z's "On the Run Tour" on August 2, 2014. Pasadena created the Pasadena Municipal Light and Power Department in 1906. On May 3, 1906, a $125,000 bond was issued to pay for the construction of a power plant. This first power plant was a wood frame and corrugated sheet iron structure which housed one 200-kW Crocker-Wheeler generator driven by a Fleming-Corliss engine, one 200-pound pressure boiler, a condenser, pumps, and other auxiliary equipment and only supplied power to the city's street lights. Expanding continued and more generating capacity was expanded and the city then offered power to commercial customers in 1908, and bought out Southern California Edison's Pasadena operations in 1920. In 1928 the city contracted with the federal government to buy electricity from Boulder Dam, later renamed Hoover Dam, which began delivering power in 1935. Fuller Theological Seminary, one of the largest multidenominational seminaries in the world,  sits just east of downtown Pasadena. It has announced plans to move to Pomona by the summer of 2021. 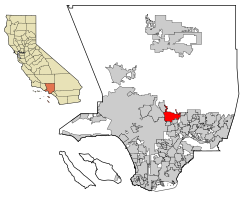 The Pasadena Unified School District encompasses 76 square miles (200 km2) and includes Pasadena, Altadena and Sierra Madre. There are 17 K-5 elementary schools, one K-8 school, five middle schools, two 6-12 (secondary) schools, and two high schools. There are also a number of private and parochial schools in the city. The Civic Auditorium is on Green Street. It was designed to be the south cornerstone of Pasadena's Civic Plaza. Every year, the popular television competition, American Idol films their "Hollywood Week" show there. It was also the venue for the Miss Teen USA 2007 pageant. The main auditorium is large enough to have been home to the annual Emmy Awards ceremony for 20 years, from 1977 to 1997. Pasadena has been home to a number of notable radio stations. In 1967 radio iconoclasts Tom and Raechel Donahue took over an aging studio in the basement of the Pasadena Presbyterian Church and introduced Los Angeles to FM freeform radio. Broadcasting under the KPPC-FM call sign at 106.7 FM it quickly became the voice of the counterculture and provided the soundtrack to LA's hippie era. [ citation needed] Early on-air personalities included Michael McKean, David Lander, Harry Shearer, and Dr. Demento. The staff was fired en masse in 1971 and the station lost its distinctive personality. [ citation needed] KPPC later went on to become KROQ-FM which is owned by Entercom. Pasadena's largest newspaper is the Pasadena Star-News, first published in 1884. The daily newspaper also publishes the Rose Magazine. The Pasadena Journal a community weekly featuring the Black voices of the San Gabriel Valley since 1989. The Pasadena Now is a community news website covering stories in the community since 2004. The Pasadena Weekly, an alternative weekly, has been published since 1984. Pasadena Magazine is a magazine published by MMG Publishing with offices located on South Marengo Avenue. It started publication in 2008. Amtrak took over passenger rail operations in 1971, serving Pasadena with trains such as the Southwest Chief, Las Vegas Limited, and Desert Wind. On January 15, 1994, the final Southwest Chief train arrived in Pasadena. ATSF sold the line between Los Angeles and San Bernardino via Pasadena (known as the "second division"). (Now the Southwest Chief operates over the transcon via Fullerton.) The LACMTA Gold Line still uses the same right-of-way (although different tracks) as the Santa Fe. The old depot is still visible at the Del Mar station. Electrified Light Rail was the preferred alternative to Metrolink or similar style service because the city of Pasadena did not like or want diesel locomotives traversing the city. [ citation needed] The construction of the Gold Line also allowed the closure of the former railroad crossing along Colorado Boulevard which meant that motorists and the Rose Parade would no longer be hindered by trains. 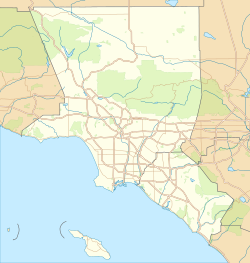 Rosemead Boulevard ( SR 19) is a state highway on the eastern edge of Pasadena and unincorporated Pasadena from Huntington Drive to Foothill Boulevard. An obscure portion of the Angeles Crest Highway ( SR 2) in the San Gabriel Mountains cuts through Pasadena near the Angeles Crest Ranger Station. This 2-mile (3.2 km) stretch of highway in the Angeles National Forest is north of La Cañada Flintridge and west of Mount Wilson and is approximately 3,000 feet (910 m) in elevation. A The number of people counted statistically in demographics will sometimes exceed 100% because some Hispanics and Latinos identify as both White and Hispanic. 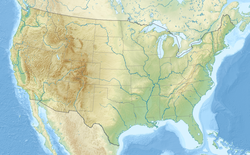 See Race and ethnicity in the United States Census. ^ " Service Location." China Eastern Airlines. Retrieved on October 20, 2012. "Los Angeles 55 South Lake Avenue, Suite 120, Passadena [ sic], CA 91101 U.S.A"
^ " Altadena Station Archived January 9, 2010, at the Wayback Machine." Los Angeles County Sheriff's Department. Pasadena's police department works with volunteer neighborhood watch groups. These groups report suspicious activity to the police. Retrieved on January 21, 2010. ^ Library, City of Pasadena |. "Central Library – Pasadena Public Library". ww5.cityofpasadena.net. Retrieved 2018-02-02. Winter, Robert (2009). "Pasadena, 1900–1910: The Birth of Its Culture". Southern California Quarterly. 91 (3): 295–318. doi: 10.2307/41172481. JSTOR 41172481.